Hi, I hope you had a weekend that was as awesome as mine because I had so much fun that I am feeling generous in sharing my joy. Quick, revel in my awesome weekend vibe before I take it back! I love having fun like a fat kid loves cake! And I’m secretly a child under all these layers of adulthood. Yesterday, I had the most fun I ever had this year and I was so giddy with joy that I nearly passed out. Haha, true story. Everyone who met me the past few weeks all said the same thing about me – that I have this joie de vivre, or “natural high”, and it was extremely infectious even though they think I am insane. Some even said they can’t stand how annoyingly optimistic I am with life. One tried to push me down the canal once but I laughingly waved her off. Another one would shake her head while the other would remind me to take my medication to keep my craziness hidden. HAHAHA. Either they are a very cynical bunch or I am really a child in an adult suit. Do not answer my rhetorical question. It’s as though I have this bubble amour around me and everything just bounces off. Or MAYBE I JUST RADIATE SUNSHINE OUT OF MY ARSE. What can I do when I am naturally this delightful, eh? But mostly, my friends would laugh till their tummies ache at how enthusiastic I am over every single thing and how wonderful I think everything is and how keen I am to try new things all the time. They say they have never met anyone who can get “high” on life so easily, without any alcohol. Like if someone said “let’s go west”, I’d go “OK!” and start heading in that direction without asking why. If someone suggests to go anywhere foreign, I’d raise my hand first to sign up for the excursion. Or if someone starts talking about eating some exotic cuisine, I’d eagerly grab everyone to go try it because I want to do something interesting or just to see what it’s like. I bet if someone tells me there’s a pot of gold at the end of a very tall bridge if I jump off from it, I’d do it. Partly because of the gold but mainly because I want to experience the adventure of jumping off a tall bridge! Just yesterday, the minute I saw Kung Fu Panda from afar at Universal Studios, I started running after him because I wanted to take a picture with my favourite cartoon character. Then halfway, it was as though the world around me had paused. Time had stopped. Voices and noises were mute because I suddenly realised I was back to being 10 years old again and that was exactly how I’d react in my childhood. It was only a snapshot moment of thought before someone hit the play button on life again. But it was an epiphany that made me smile. That was when I realised I have never really grown up. Maybe deep down, I’m a young kid at heart. You know what, I feel very much like Spongebob Squarepants and a little bit of Patrick! There is this sense of childlike candour and innocence in me that I can’t quite explain in words. I wish I could just put your hand on my heart and let you feel what I feel. That’d be so much quicker. Just like Spongebob and Patrick, I always try to look at the bright side of things. Sometimes I laugh at the silliest thing I do because I can be quite duh at times. I even sound duh IRL! I’m overly helpful at times, especially when I am familiar with the subject matter. I get very excited whenever I learn something new and I’d always tell someone about it so they can learn something new too. I’d start using my newfound knowledge in my conversations just to apply what I learned but mainly it’s to show off. HA! I always think the best of everyone because I truly believe in human goodness like how Spongebob never sees what mean things Squidward does or says to him. Or at least I tend to give people the benefit of the doubt anyway. A bit naive of me, some would say. I’m blunt at times when I speak without thinking. I can be ridiculously honest but it also means I’d always say what I mean and I will always try to keep my word if I have made you a promise. Just like how Spongebob would carry on working even if he had an injured, seriously infected right thumb. Or how he would try to help or make Squidward happy even if his neighbour always bullies him. Because we are kind like that! Isn’t Spongebob the most adorable thing ever? Every day seems like a perfect day to have fun and every little thing could easily make my day and make me grin so wide my face feels overly stretched with Botox! I think I have reclaimed my happy bubble (which was lost since early 2008) and I’m going to annoy people with it. Hehe. 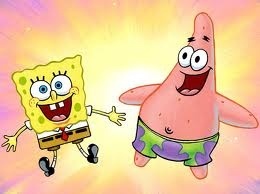 P/S: I love watching Spongebob cartoons!